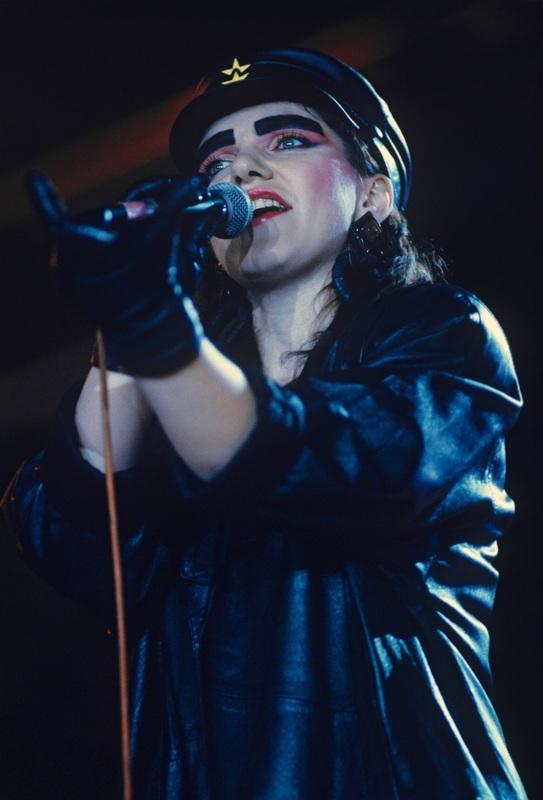 Zhanna Aguzarova was one of the most famous "perestroika rock" singer. Looking back on Soviet rock music during Gorbachev’s perestroika, we find a blurry collage of different songs that are not exactly political by nature. The songs themselves did not have to be blatantly political, because the very act of creating an underground band was a protest in itself. The perestroika reform period posed a big challenge for underground rock musicians, and not everyone survived it. Perestroika reputedly started in 1985 and lasted for about five years, when Mikhail Gorbachev became General Secretary of the Communist Party of the Soviet Union and leader of the country. Soviet rock music blossomed during those times, with some historians considering it among the major factors behind the collapse of the Soviet Empire — along with food shortages, lack of human rights and freedoms, censorship and closed borders. Yet just a year before Gorbachev was appointed leader of the Soviet Union, Soviet rock music was going through difficult times. In 1984, a major government attack on it was unleashed, following General Secretary Konstantin Chernenko’s speech in which some music bands were accused of ideological and moral sabotage against the Soviet society. Blacklists were issued by the top brass of the Communist Party and sent to all cultural and youth departments countrywide. The lists included many Soviet underground rock bands: They were prohibited from performing live, and their tunes were banned from being played at discotheques and public events. Rock musicians came under pressure, sometimes being forbidden to use their rehearsal halls. Some of them were quickly called up for military service. A few rock musicians — such as Alexei Romanov, leader of the band Voskresenie, and Zhanna Aguzarova, the female singer from the band Bravo — received real jail time. It was typical for the Soviet system in the 1970s and 1980s to link jail sentences not with ideology, but with illegal business practices or passport violations. All of a sudden, though, everything changed from black to white for Soviet rock music. Soon after Gorbachev’s appointment, rock music was legalized in the Soviet Union, while previously underground bands were allowed to be played on the radio and appear in TV shows. A flood of favorable articles about underground rock filled Soviet newspapers and magazines. Rock fans got a chance to purchase official tickets for concerts featuring their favorite bands for the first time in their lives. One of the first signs of changes during perestroika was a New Year’s Eve festival called “Yolka” (“Christmas Tree”), which was held in a Moscow culture club under the Kurchatov Nuclear Energy Research Institute. The newly formed “Moscow Rock Laboratory,” under the guidance and supervision of Moscow’s Communist Party headquarters and the Leaders of Young Communists League, held an unthinkable rock festival featuring more than 10 live bands that were blacklisted just a year earlier. Moreover, bands performed their songs without any censorship. Even without any promotion in Soviet mass media, news of this festival spread very quickly around Moscow and 500 seats inside the culture club (which looked more like a theater with a stage and red velvet chairs) were overcrowded. Some people even tried to get in using roof windows, basement walkways and fire escape stairs. The enormous interest among media and promoters went to the most popular underground bands: Moscow’s Mashina Vremeni and Brigada S, Leningrad’s Kino, Aquarium, and Alisa, and Sverdlovsk’s Nautilus Pompilius. These bands along with many others quickly became regular guests of late-night TV shows, such as “Vzglyad,” “Musical Ring,” “Program A,” which were also launched during perestroika. There were only two TV channels in the Soviet Union, which broadcast from Moscow and could be watched by about 250 million Soviet citizens. The TV show “Music Ring” was particularly unique because of its plot. A few music groups — mostly from underground scene — were put against each other in a kind of “face-to-face” competition that included music performances and Q & A sessions with a studio audience. The audiencewas made up of all kinds of people, from Communist officials, college professors, writers, students, housewives and fans of the bands. Sometimes, musicians found themselves in ridiculous situations, having to explain why they were playing rock music and answering similarly asinine questions. However, because the TV show was broadcast live to the millions of viewers, people did get a chance to see how their favorite underground rock bands looked like and what they had to say. The TV audience voted via phone calls, selecting winners of each round. The Soviet film “Assa” (1987), directed by Sergei Solovyov and shot in the main Soviet movie studio Mosfilm, became one of the signs of Russian rock music’s mainstream recognition. Its soundtrack was based on various rock tunes from underground bands; some underground rockers even had cameos in the movie. Its screening was accompanied by week-long rock concerts in the same movie theatre where the film was shown. For a good example of perestroika rock, check out the1987 video "Замыкая круг (Closing the Circle)," which was made in the style of the famous 1985 video "USA for Africa." In the video, Soviet pop, rock and heavy metal stars sing together as a group. Going from underground to mainstream was not an easy process for rock bands during perestroika. Musicians who had become accustomed to outsiders and the bohemian lifestyles suddenly received an opportunity that they could not have even dreamt of a few years earlier. The majority of rock musicians were poor, even by Soviet standards of living. In addition, according to Soviet laws, all citizens had to have an official job; underground rock musicians were working as security guards, janitors and concierges. Some musicians were students in various institutes that had nothing to do with music. Student status also provided them with temporary protection from military service. It was not easy for underground musicians to adjust themselves to a mainstream lifestyle of radio stations, TV and movie studios. Regular touring was also something that they did not get used to. Many musicians had no discipline or desire to deal with mainstream Soviet social circles that they did not like. Alcoholism was also an issue for some musicians, preventing them from becoming members of Soviet society. For example, Mikhail “Mike” Naumenko (1955-1991), the leader of the beloved underground band Zoopark, never became a rock star of the perestroika era. Zoopark never fully adjusted to the new reality for rock musicians. Even despite the fact that they continued to play occasional concerts and make recordings, they never got into the spotlight of TV and mass media. Instead of a logical move from underground existence to mainstream celebrity, Naumenko did not show much interest in joining the perestroika craze that was popular among musicians of that time. He suffered from depression and alcoholism, which led to his death in 1991. It was strange that Zoopark never took part in the perestroika mainstream, compared to other bands from the city of Leningrad, such as Kino and Alisa. Sudden popularity and recognition with the mainstream audience came with a price tag for former underground bands. A few crafty music promoters saw huge earning potential in famous rock bands, which were being offered concerts at sports arenas with 10,000 seats. Thus, rock musicians,who had felt lucky a few years earlier if they could play in a culture club for 100 people, turned into stadium rock stars, receiving vast sums of cash that exceeded their wildest imagination. In August 1990, at the height of the band Kino’s popularity, their frontman Viktor Tsoi was killed in Latvia, in a head-on collision with a bus. Tsoi had been driving his own car at speeds of up to 80 miles per hour. According to the official version, Tsoi fell asleep while driving.His death sent shockwaves through millions of fans, as well as the emerging music industry in the Soviet Union during perestroika. For many people, the reason for his tragic death lies in the band’s work with music mogul Yury Aizenspits (1945-2005), which led to drastic changes in their lifestyle and circle of friends, as well as a departure from their modest Soviet life in Leningrad. Prior to his stardom, Tsoi was working night shifts as a stoker in a steam shop shoveling coil. True to the law of “supply and demand,” newly formed bands were sprouting everywhere in the Soviet Union and trying to cash in on perestroika’s ideas. Bands that came out of nowhere were singing about meat shortages, Soviet bureaucrats that were detached from reality, corruption, and other issues from Gorbachev’s speeches of the second half of the 1980s. All major music trends of the 1980s were reflected in the Soviet underground rock scene, from acoustic ballads to glam metal. Many of the groups used various types of promotion, printing their logos on pins, T-shirts and other souvenirs. The main symbol of that time was the “hammer-and-sickle” emblem with perestroika words incorporated into it. Musicians and music fans were wearing T-shirts with perestroika graphics because, for them, it was sign of hope and a better future. This is how the term “perestroika rock” was born. Basically, perestroika rock was based on songs from various music styles that were recorded in pre-perestroika years but reflected the spirit of perestroika: the desire for change, a more open society and liberalization. Probably the most famous song that represents perestroika rock was and still remains “Miy Zhdom Peremen” (“We Want Changes”) by the band Kino. Another well-known song related to the period is Aquarium’s “Poezd v Ogne” (“Train on fire”). This song was accompanied by a music video that was shot in a style reminiscent of Soviet movies about the 1917 Revolution and the 1920s Russian Civil War. It shows musicians dressed like the working-class heroes that fought in the Russian Civil War to defend their homeland. This video, along with the song’s lyrics, was a perfect match for perestroika’s spirit and was frequently shown on Soviet TV. Perestroika rock was not political or protest music, since it was based on songs previously written by underground bands. The strange feature of underground rock songs is that there is almost no blatant political protest in them: Creating an underground rock group was considered a big risk and was an act of protest in itself. Actually, underground rock was more imaginative and suggestive than political, all things considered. During perestroika, some bands that were formerly known as underground continued to write new material in their own style, which they had developed before Gorbachev came to power. So, looking back on Soviet rock music during perestroika, we can see a mixed bunch of songs from various bands that are not exactly political by nature. Vasily Shumov is a musician, producer, photo and video artist. Born in Moscow, Russia, he founded Moscow's first new wave and electronic band, Center (Центр), in 1980. From 1990 to 2008, he lived in Los Angeles, California, graduating from the California Institute of the Arts with a Master of Fine Arts in 1998. Vasily has exhibited numerous solo and group projects featuring his photo and video art. His most recent personal photo art exhibition was held in April 2013 at the Central House of Artists in Moscow. In June 2013, he performed with Center at PAX Festival in Helsinki, Finland.